Newcomer Ava Michelle has been cast in the high school comedy that Nzingha Stewart is directing. After what it described as a worldwide casting call, Netflix has selected newcomer Ava Michelle for the title role of its comedy Tall Girl, which has begun production in New Orleans. Michelle, a 6-foot-1-inch-tall actress, dancer and model, will make her feature-film debut in the role of Jodie, a 16-year-old who is the tallest girl in her high school. The film also stars Griffin Gluck (American Vandal) as Jack Dunkleman, Jodi’s best friend; Luke Eisner (The Goldbergs) as Stig, a handsome and equally tall Swedish foreign exchange student; Sabrina Carpenter (The Hate U Give) as Harper, Jodi’s older sister; and Paris Berelc (Alexa & Katie) as Liz, the unconventional best friend of Jodi’s bully. Rounding out the cast are Steve Zahn (Valley of the Boom) as Richie Kreyman, Jodi’s manic and anxious dad, and Angela Kinsey (Haters Back Off!) as Helaine Kreyman, Jodi’s former pageant-queen mom. Additional castmembers include Anjelika Washington (DC Universe’s Stargirl) as Fareeda, Jodi’s best friend; Clara Wilsey as Kimmy, the most popular girl at school and Jodi’s nemesis; and Rico Paris as Schnipper, a popular jerk and one of Jodi’s regular tormentors. Directed by Stewart, who is repped by Paradigm and Management 360, and written by Sam Wolfson, the film is Netflix’s fourth collaboration with Wonderland’s McG and Mary Viola. Wonderland’s Corey L. Marsh serves as a producer. 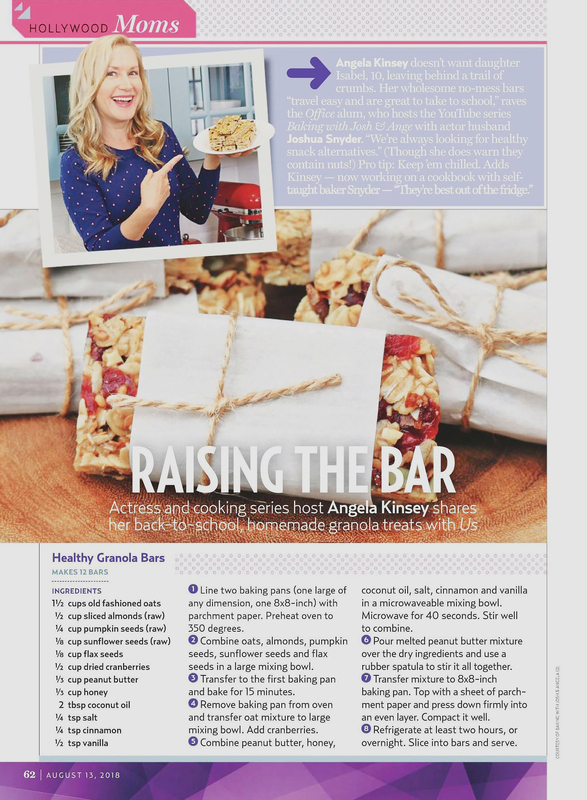 Angela shares a recipe for Healthy Granola Bars in the August 13 issue of US Weekly. Angela Kinsey knows the highs and lows of parenthood. Known to many as Angela from NBC’s “The Office,” Kinsey has a 9-year-old daughter named Isabel and two stepsons, Cade and Jack. Over the years, the actress has tweeted funny anecdotes and musings from her everyday motherhood experiences, from silly kid quotes to adventures in snack time. We’ve rounded up a sample. Keep scrolling for 20 funny and relatable tweets. Angela Kinsey knows about Pizza Kingdom. When The Office star showed up in College Park the night before her Student Entertainment Event’s lecture, she was hungry. On her way to the parlor known for giant late-night slices, a rowdy group from the bar pointed her to Lotsa. Although her food search ended in trail mix at the hotel, at least one student snapped a photo with the 5″1′ actress known for playing the uptight, cat-loving, party-planner Angela Martin. On March 1, Kinsey relived one of the happiest parts of her career as she spoke to a sold-out Grand Ballroom. And no, she’s not tired of talking about it. “It makes me really proud that something we did all those years ago is still resonating with people,” she said before the show. When celebrities hang out with Bustle editors, we want to give them the chance to leave their mark. Literally. So we hand them a pen, a piece of paper, a few questions, and ask them to get creative. The rest is up to them. This time, Haters Back Off star Angela Kinsey is leaving her mark in the Bustle Booth. Angela Kinsey loves the kind of comedy that makes you recoil in discomfort. She first made a name for herself as Angela Martin, Dunder Mifflin’s severe, cat-loving accountant, on The Office. Now, Kinsey can be seen in the second season of Haters Back Off as Bethany, the mother of Miranda Sings. The Netflix adaptation of Colleen Ballinger’s fame-hungry YouTube persona can be as painfully funny and hilariously painful as Kinsey’s first big TV success. And though the actor couldn’t be more personable in real life, she takes some pleasure in throwing an audience off their game. Like Angela, Bethany has some domineering personality traits, but Kinsey’s goal as a performer is never to let those more prominent characteristics totally define her characters. So though Miranda’s mother in the series appears meek and desperate to be loved, there’s much more to her than that. Kinsey tried to explore the same depths with Bethany, who, despite her issues, “can still have fun” and “still flirt with a man, even if it’s awkward,” the actor says. And discovering this character started with Kinsey zeroing in on one big point of overlap in their lives. And while it’s not particularly common to, say, fake an illness to get a date, Bethany is one of the more down-to-Earth characters in Haters Back Off. Kinsey, who got her start in improv comedy, does get to have her “little moments” of determined humor. (“Emily, you know very well what a bag of salami is,” was an ad-lib, she says.) But otherwise, she looks at Bethany as part of the foundation for Haters Back Off to be as bonkers as it sometimes needs to be. But it’s Kinsey, her hair dyed brown to match Ballinger’s, who owns the show. Wearing a wrist brace for her “undiagnosed fibromyalgia,” preparing for a casual meeting with a man she likes with “conversation cards” (“Hi, Keith,” “Acts surprised”), walking into church holding Emily by the pinky, her Bethany is full of sadness and hope and ragged dignity. She takes the series from a twisted lark to something deeper and grander, where even people who don’t know their YouTube from their Vimeo may find something valuable. You can read the full review here, and be sure to watch “Haters Back Off” on Netflix if you haven’t yet! Angela and her daughter, Isabel, are featured in ‘Comedians & Their Kids’ in the latest People. They both look adorable and they sound like the perfect mother-daughter duo! Being a Tidy Insider has its perks. The awesome people at Tidy Cats invited me to go behind the scenes to watch the production of the new Tidy Cats Stank Face Public Service Announcement (PSA) starring Angela Kinsey (below). If you’ve seen the hit TV-series, “The Office,” you’ll recognize her as the actress that played crazy office cat lady, Angela Martin. I hope you all enjoy the interview! You can read Angela’s interview with The Catnip Times here. And, you can find out more about TidyCat and #StopStankFace here. ‘The Office’ alumna Angela Kinsey is set as a lead in ABC’s multi-camera comedy pilot ‘The 46 Percenters’. The casting stems from Kinsey’s collaboration with ABC earlier this development season on a buddy comedy project, which she co-wrote and was attached to star in. ‘The 46 Percenters’ is described as an unromantic romantic comedy about the 46% of the population who choose to stay married as told through the POV of three couples. Kinsey will play half of one of the couples, Marni, a wife and mother. Kinsey, repped by UTA, Link and Felker Toczek, will recur on TBS’ new comedy series ‘Your Family Or Mine’. Female buddy comedies have been hot on the big screen with such recent hits as The Heat and The Other Woman. ABC and Sony Pictures TV are looking to extend the streak to television with a single-camera comedy starring The Office alumna Angela Kinsey and executive produced by Will Gluck. Co-created by Kinsey, who will co-write the story, and Rachel Specter & Audrey Wauchope (Cougar Town), the untitled comedy (aka I Love Your Ex) centers on a woman and her ex-husband’s new girlfriend who end up becoming BFFs — much to the annoyance of the guy stuck in the middle. The Big C creator/exec proucer Darlene Hunt will serve as showrunner and executive produce with Gluck, Kinsey, Specter and Wauchope. Sony TV, where Hunt and Gluck’s Olive Bridge Entertainment are based, is producing the comedy, which has script commitment plus penalty. Gluck is repped by UTA and Robert Offer; Hunt by UTA and Joel McKuin; Kinsey by UTA, LINK Entertainment and Fred Toczek; Specter and Wauchope by UTA and Luber/Roklin. In a TV era where there are reality shows featuring housewives from New York, New Jersey, Atlanta and assorted other spots on the map, it would almost take a conscious effort not to have stumbled across one of the many reality show franchises. It wasn’t intentional, but Angela Kinsey — you know her best as Angela Martin from “The Office” — had never seen a single “Housewives” spat, battle, back stab or cat fight. That wasn’t so bad until Kinsey found herself cast in the new Hulu comedy “The Hotwives of Orlando.” The seven episodes in the first season of the reality show spoof will be available on Hulu on Tuesday. Kinsey joins Casey Wilson (“Happy Endings”), Kristen Schaal (“Flight of the Conchords”), Tymberlee Hill (“Drunk History”), Danielle Schneider (“Upright Citizens Brigade”), Andrea Savage (“Step Brothers”) and Paul Scheer (“The League”) in a parody of the real housewives genre. Kinsey plays Crystal Simmons, a deeply religious wife to an extremely controlling husband (Seth Morris). She’s done everything in the name of God, including getting breast implants. It’s her “holier-than-thou” attitude that causes problems for the group. Seeing the shows cleared up one misconception Kinsey got from reading the “Housewives” scripts. Her initial reaction was that the “Hotwives” scripts were too far fetched. After watching a few “Housewives” episodes, Kinsey realized that what happens in the reality shows is so wild that it’s easy to lampoon. Working on the series gave Kinsey a chance to have fun playing a horrible character. It was also fun because it’s rare when a comedy isn’t dominated by a male cast. Kinsey also likes that the “Hotwives” cast is filled with performers who have long histories doing improvisational comedy. She praised the scripts by series creators Dannah Feinglass Phirman and Schneider, but she likes that the cast members have freedom to expand on their characters. “We would shoot the script but then we could play around and we all came to play. Those moments meshed with the script so great,” Kinsey says. It’s a little bit of a marvel that there was time to improvise since the episodes were filmed in a week. Kinsey says some of the days were grueling as cameras rolled until 3 a.m., but it reminded her of the early days of her career where everyone had to be a team player to get low-budget projects done. “Hotwives of Orlando” is very different from Kinsey’s past work because it will be broadcast on Hulu, with all of the episodes available immediately instead of fed to the audience a week at a time. Kinsey sees the benefits of both delivery methods. “I have met two kinds of people. There are those who like appointment TV. They know they need to be at home on Sunday to watch ‘Game of Thrones.’ But, the way people watch TV is changing,” Kinsey says. “There is such an immediate access through other mediums like computers.